This San Rafael family was motivated to reduce their electricity bill of over $4,000 per year and achieve energy independence. With a keen eye for positive returns on investments the Dufficy family immediately saw the financial benefits of solar, so it was an easy decision to “go green”. This powerful system consists of 48 solar panels, each controlled by an Enphase microinverter to maximize energy production by 10–12% and reduce the impact from shading. 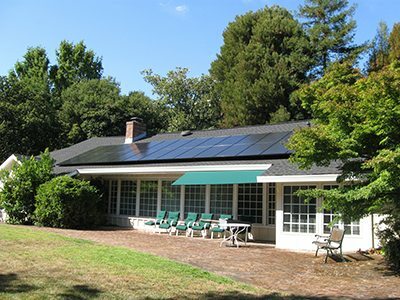 Microinverters also allow the homeowner to closely monitor each panel’s performance. The system was designed using an aesthetically pleasing all-black panel. The Dufficys now have more money in their pockets while reducing their carbon footprint. Surface Area 842 sq. ft.